Additive Manufacturing with Metal Powders Market size was above USD 215 million in 2016 and industry expects significant gains to surpass 4.5 kilo tons by 2024. 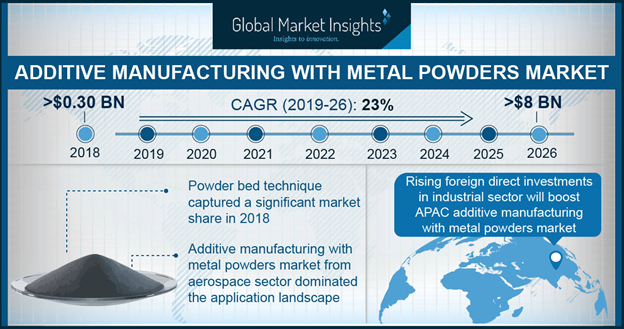 Rising influence towards light weight and functionally integrated parts in automotive and aerospace industry to reduce environmental impact along with biodegradable implants for medical treatments should drive additive manufacturing (AM) with metal powders market growth. Increased usage of AM in fabrication of end-use products in automotive, aerospace, oil & gas, dental restorations, and medical implants should propel technology demand. Positive indicators for increasing usage in medical applications specifically for orthopaedic implants and dental restorations owing to design freedom, high customization, along with high degree of functional integration, is likely to contribute towards additive manufacturing with metal powders market size. In 2016, the rate of hospitalization with hip replacement accounted to be over 35% in the U.S., thereby enhancing technology demand in orthopaedic implants. As of 2016, over 35 million Americans are losing their teeth in one or both jaws. Growing demand for tooth replacement along with rising number of dental injuries owing to sport injuries and road accidents should boost dental implants industry, thus favouring additive manufacturing with metal powders market size. Powder bed fusion (PBF) technique is used in medical implants as well as in production of jewellery and watches, which has resulted growth in metal additive manufacturing demand. Direct Metal Laser Sintering (DMLS) and Selective Laser Melting (SLM) techniques from PBF method are used to draw on the digital data and a user-friendly software, such as CAD to prepare the production process. Even complex structures of jewellery and watches such as one-off interwoven or interlocked pieces can be manufactured in high-end quality, thus stimulating additive manufacturing with metal powders market demand. Titanium, nickel, cobalt, aluminium and copper based alloys are used in AM process to make various components such as multiple ports, ducts, valves, impellers and small & complex structures in different industrial sector such as oil & gas, aerospace and automotive. These products possesses superior properties such as corrosion resistance, high strength, durability heat resistance and good electrical conductivity, which increases its application scope in making lightweight components for automotive and aerospace industries, resulting into increased additive manufacturing with metal powders market size. Key raw materials including titanium, nickel, cobalt, copper, aluminum and stainless steel powders are used in 3D printing process. High cost of these raw materials, intellectual property issues of the product manufactured and size limitations of the object may challenge industry profitability and may have an impact on additive manufacturing with metal powders market price trend. PBF technique from metal AM process should expect growth close to 27% by the end of forecast period. PBF process uses laser or electron beam to melt and fuse materials together. It involves spreading of material over previous layers involving mechanism including roller and a blade. This technology works with variety of materials such as titanium and stainless steel in printing 3D medical devices. PBF technique is involved in creating dental restorative and prosthetic devices, thus propagating additive manufacturing with metal powders market size. Blown powder technique demand should surpass USD 130 million by 2024. The raw materials are blown in the processing zone, where it contacts the plasma or laser beam which are melts the particle, and the particle is then subsequently deposited on the surface. Direct Metal Deposition (DMD) and Laser Engineering Net Shape (LENS) techniques comprises in this process. DMD technique may register significant growth at over 26% by the end of forecast period. This technique is used to repair broken parts and hence reduces cost and time in building new products, resulting into increased additive manufacturing with metal powders demand in aerospace and automotive industries. Titanium alloy powders exhibit superior shear strength, corrosion resistance, weatherability, and may register growth close to 29% by the end of projected timespan. Ti-6Al-4V is the most common used titanium alloy which provides high strength, formability, light weight and corrosion resistance, making it suitable for aerospace application, thus stimulating additive manufacturing with metal powders market size. Stainless steel powder from 3D printing market size should exceed USD 240 million by 2024. Duplex stainless steel is characterized by a balanced austenitic and ferritic microstructure, which indeed provides a combination of corrosion and mechanical properties. 2205 duplex stainless steels have widespread application scope in automotive sector as it can withstand temperature upto 500 degree celsius. Rapid industrialization rate along with increased usage of AM technology in automotive industries in Germany, France and UK may positively influence additive manufacturing with metal powders market growth. Additive manufacturing with metal powders market from automotive application should witness significant gains at over 25%. 3D printing technology provides high-performance products based on complex designs. Components manufactured through these technologies are extremely light but highly rigid and comprises of integrated functions. Shift in consumer focus towards lightweight components in automotive in Europe to reduce carbon emissions, should favour industry growth. Additive manufacturing with metal powders market size from medical applications should exceed USD 200 million by 2024. Powder bed techniques are used to produce variety of medical devices which should match the anatomy of the patient. Rise in number of sports based facial injuries has resulted into increased demand for oral rehabilitation along with increased surgeries related to hip replacement, knee arthroplasty and spinal fusion should boost product demand. Germany additive manufacturing with metal powders market size may be valued at over USD 70 million by 2024. Presence of various industry giants such as Boeing, Mercedes, Volkswagen, and Airbus along with usage of these technologies in aerospace and automotive industries for making of small, complex and lightweight components should drive regional industry growth. Asia Pacific led by China, India, South Korea and Japan metal additive manufacturing market size should register gains close to 25% by the end of the forecast timespan. Government initiatives to start national 3D printing labs along with low raw material cost in China and Japan, should boost product demand in the region. France additive manufacturing with metal powders market size may surpass USD 50 million by 2024. Increasing emphasis by EU Commission to reduce overall weight of the vehicle in order to cut down emissions along with advancements in metal 3D printing technology has opened up new horizons for cleaner, safer and lighter products should drive regional industry growth. Global additive manufacturing with metal powders market share is moderately consolidated and competitive. Major industry participants include EOS, Arcam, GE, Concept Laser, 3D Systems, Trumpf, Renishaw, Realizer, Optomec, and ExOne. Other manufacturing companies include Ping, Plunkett Associates, Matsuura Machinery, Progold MTU, and Puris which cater to domestic and international market. Manufacturing companies are focusing in expanding business across regions and developing strategies for further technological advancements, product development and strengthen global presence. Additive manufacturing is a technology that is used to build 3D objects by the addition of layer-upon-layer of metal powder using computer-generated component design data such as CAD. Various products including titanium, cobalt, copper, nickel, aluminum and stainless steel are used with various manufacturing techniques such as DMLS, SLM, EBM, DND and LENS, resulting into enhanced product demand. It lessens environmental pollution triggered by wastage of material. Technological advancement in production processes along with constant efforts put by industry players to meet various ASTM standards to control carbon emissions will drive additive manufacturing with metal powders market growth.